As you may know, a little personal project of mine is to tabulate and track the demographics of named Star Wars characters from year to year, so that we fans can discuss with some accuracy how diverse they are (or aren’t). If this is the first you’re hearing of it, click the series tag at the end of the piece or see last year’s entry for a more thorough explanation. It’s been an interesting year for this subject—two new films have been released since my last update, and only three original adult novels.1 This is a self-explanatory phenomenon, of course, because two films means two novelizations, which means two fewer original stories. Add in the final season of Star Wars Rebels and for the first time, the amount of visual Star Wars media in a given year equaled the amount of published media—at least by the methods I’ve chosen for this project. While that’s very much out of the ordinary for the franchise—last year’s update included one film, one season of Rebels, and eight novels2—it helped bring into focus something I’ve only vaguely acknowledged over these last few years: when characterizing the overall diversity of the franchise no amount of novels can really compare to the representational value of a movie star. So even though there are far more novels overall than films or television series, the latter category deserves at least equal weight to the former, debatably even moreso—and with multiple live-action television series on the way it’s only getting more important. Another development of the past year was the dawn of the #SWRepMatters social media campaign. Short for “Star Wars Representation Matters”, the hashtag was started by a group of fans on Twitter that includes several former Eleven-ThirtyEight guest contributors to highlight different communities of underrepresented people and why they belong both in the Star Wars universe and behind the camera (or pen). It’s been a great campaign to watch (with no signs of letting up!) in part because of the diversity of participants—one reason I choose to talk about this in such a dry, academic way is because I’m not from an underrepresented community; I can’t speak about it as insightfully and passionately as fans who really do long for that representation, and I wouldn’t presume to be an arbiter of which characters are or are not “good representation”—numbers, though, I can do. Speaking of which, I can say that whatever their overall demographics, this year’s two film releases had a heaping helping of fascinating, provocative female characters. While critiques certainly exist of how TLJ uses Admiral Holdo, and how its women and characters of color intersect generally, many were quick to label it a “ferociously“, “triumphantly“, feminist movie—at least by Star Wars standards. I point that out not to endorse it as the only valid reaction but as a contrast with Solo: A Star Wars Story, whose female characters met with some much more universal pushback. While Qi’ra acquitted herself fairly well—thanks in large part to her managing not to die—Val and L3-37 had no such luck, falling by the wayside and even being used for parts in order to advance the male characters’ arcs. By the final act’s reveal that Enfys Nest was herself a solemn, formidable woman of color, many fans had already run out of patience. So what if I told you that Solo actually came closer to gender parity than TLJ? With eight named female characters out of twenty-four total, Solo scores a 33 to TLJ’s 30 (eleven out of thirty-seven). I should note here that both scores are pretty good by historical standards—at the dawn of the new canon, when all I had to go by was the first six films and The Clone Wars, the average parity score was 21. Sadly, the years since have only managed to nudge that up to 22—it will take a lot to mitigate the terrible gender demographics of the original trilogy (and, frankly, Rogue One) but if the past year is representative of the a normal among Star Wars visual media it’s a respectable start. But still: Solo scored higher than TLJ? Really? While that’s due in large part to Solo having an unusually small named cast, it was still a hard pill to swallow, and if I’m honest, it cast a harsh light on this entire operation of mine—obviously the actual quality of the characters as written is at least as important as how many there are, but if the two factors can diverge that much, of what real value is this information? If gender parity or overall diversity tick up or down a couple percentage points from year to year, is that actually important to know when compared to quality of representation? I also asked the vocal participant in #SWRepMatters (and Rae Sloane fangirl) known on Twitter as @southerncynic, who said that “treatment of POC characters on screen is still an overall issue. We’ve proven that female leads can break the box office. Black Panther has proven that a film with mostly black actors can break the box office, so…why can’t we have either of these things in Star Wars? It’s as if they are testing the waters”, she observed, “slowly adding more POC faces. First step, Boyega. Second, Kelly. Third, Thandie? I am happy that in the background there are more people who look like me being shown, but I am not satisfied.” The expression “testing the waters” definitely struck a chord with my experience—after almost a decade of this, even if you only look at the best, most progressive works, it tends to be a little improvement here, a little there, much of which is buried by the drumbeat of other works that don’t advance representation at all. While I was bothering them, I also asked my intrepid interviewees to tell me about some specific new characters they saw as exemplary representation. 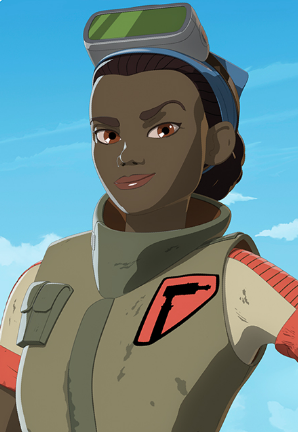 While it’s too soon to begin scoring it, the phenomenally diverse Star Wars Resistance had a huge presence in their responses, further reinforcing my sense of visual media’s increasing role in this conversation. That said, any recap of the past year in representation has to begin with Rose Tico, our first-ever leading woman of color. While it’s likely that a year from now I’ll be pointing to Resistance as a new diversity high-water mark (though The Clone Wars was no slouch in its day), such visceral reactions to these characters can’t be underestimated—not only is the show chock-full of characters of color (not to mention all sorts of fun alien species we don’t often get to know), but only a dozen or so episodes in, fans young and old are really responding to them on a personal level. Diversity isn’t just a superficial concern; it’s about giving fans characters to identify with, and the more the better. I’ve observed before that only having a single character from an underrepresented population can create unfair burdens on that character—Padmé is the only major female character in the prequels, so when she dies of a broken heart, for example, it’s easy to read that as not just an iffy character choice but a comment on women as a whole, because there are no countervailing examples. This could have contributed to some of the controversy surrounding Rose in TLJ as well (not to mention Finn and Poe), so it’s heartening that Episode IX has cast Naomi Ackie in what’s rumored to be a significant role. Resistance, of course, already has two significant women of color in Tam and Torra—two characters who couldn’t be more different from each other, because why wouldn’t they be? This is where I see my data as intersecting with the issue of “good representation”—a character that means the world to one fan might be a tiresome cliché to another, so what’s a better strategy on the creators’ part: not trying at all, or giving us as many options as possible? Since I can only keep up with so much of this franchise’s output, I have to make some tough calls about which content, quite literally, “doesn’t count”.4 These decisions are of course entirely subjective, so I try to at least be conscious of what’s going on outside the films, television, and adult novels in case something really warrants bringing up. Last year, for example, I was thrilled to share two years’ worth of Star Wars comic book data courtesy of Mynock Manor‘s Ryan Malin. Ryan and I have remained in touch since then and we’re keeping a particular eye on the disparity between female and male comics writers, both in real-world numbers and in terms of those writers’ scores—he’s finishing up with 2018’s data as we speak so keep your eyes peeled and we may have more on that soon. There’s also been some noteworthy shorter content over the past year—while short stories like those included in From a Certain Point of View and Canto Bight typically have much smaller casts than a film or a full-length novel it’s nevertheless encouraging to see them do well, at least anecdotally. Canto Bight in particular has no WHM leads at all and possibly only a couple altogether—not hugely surprising given its demographics in TLJ, but still cool. While I stand by my decision not to present shorter works on equal footing with novels, I’m considering separately scoring the Canto Bight novellas next year alongside at least some of the middle-grade books, which likewise have been quite impressive—last year Guardians of the Whills managed a diversity score of 100 and I suspect this year’s Lando’s Luck might not be far behind. Speaking of next year: not only will 2019 mark the fifth full year of the new canon and the conclusion of the sequel trilogy, it will also mark ten years since I first started doing this whole “diversity score” thing. Over the last decade the conversation around diversity and representation has expanded and evolved in ways that absolutely stagger me, egged on unsurprisingly by Star Wars’ sudden return to box-office and cultural dominance. I’ve learned a great deal from this process, not just about the content but about what really matters to underrepresented fans and how to talk about it in ways that are inclusive and foster further discussion and understanding. While I hope I’ve contributed to that understanding in a positive way, I’ve also come to appreciate all the things this data can’t tell us, and with that said, next year will be my final Minority Report. On top of presenting my final scores for the sequel trilogy, plus the first season of Resistance and another year’s worth of novels, the five-year anniversary of the new canon seems like a good opportunity to look back at just how much the needles have or have not moved so far—so for the first time I’m also going to conduct a chronological, year-by-year analysis of not just individual works’ scores, but the franchise as a whole. The Mandalorian may or may not make it into my final report but it goes without saying that live-action television is going to substantially impact the numbers going forward and I’m excited to see what that looks like. Beyond next year I do plan to continue running the numbers like I’ve always done, but rather than presenting them by rote on a regular schedule—something I generally prefer Eleven-ThirtyEight not do—I’ll save my observations for when and if something especially noteworthy happens. Here’s hoping Rian Johnson’s new trilogy finally gives us the all-porg cast we deserve.